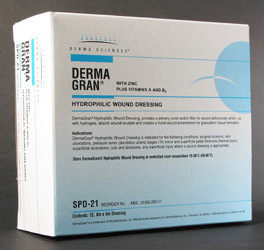 Dermagran® Hydrophilic Wound Dressing is indicated for use on skin ulcers, surgical incisions and superficial injuries, such as partial-thickness thermal burns, superficial lacerations, cuts or abrasions, or for stage II and III pressure ulcers. Dermagran® Hydrophilic Wound Dressing is indicated for use on pressure ulcers (stages II-IV), tissue trauma, surgical incisions, partial-thickness thermal burns, diabetic and venous insufficiency ulcers. Integra LifeSciences, a worldwide leader in regenerative medicine, is dedicated to improving the quality of life for patients through the development of cost-effective solutions used to treat millions of patients every year. With over two decades of clinical efficacy and a reputation for delivering quality, Integra's advanced wound care products are a premiere solution for clinicians.